When HIV was identified as the virus that causes AIDS way back in 1986, there was a flurry of research looking into ways of identifying individuals who have been infected with the HIV virus. At the time, there was already a technique developed to detect various antibodies in the blood. This technique was called ELISA which stood for Enzyme Linked Immuno Sorbent Assay. This technique is based on the lock and key theory of antibodies. Basically, antibodies and antigens work like locks and keys. One key for one lock. One antibody fits one antigen. Having the antibody means the antigen is also present. So the ELISA technique basically involves getting a little cup (aka microwell) and sticking HIV antigens (locks) all over the bottom. The cup is then filled with the serum to be tested. If the appropriate anti-HIV antibodies are present (keys), they will stick to the antigens (locks). So far so good? Now this is the clever bit. Since these antigens and antibodies are microscopic, the scientists had to figure out a way to be able to see if the locks have captured any keys. Microscopes do not work because these antigens and antibodies are just too small. They figured out that since antibodies are proteins too, they themselves are also antigens! In other words, the other end of the key is also a lock. So the scientist developed an anti-HIV antibody antibody. So this new antibody sticks to the back of the first antibody. This second antibody is also special in the fact that an enzyme is attached to it. When a special substrate is added to the mix, the enzyme will turn the substrate a different color (usually red). So there you have it. If the serum to be tested contains anti-HIV antibodies, after all these steps, the liquid in the microwell will turn red. So elegant and so simple. This came to be known as the 1st generation HIV ELISA test. Basically, antibodies and antigens work like locks and keys. However there were several problems associated with this test. First of all, it only detected antibodies to the HIV 1 virus, not HIV 2. Secondly, it only detected the IgG antibodies which can take some time to be produced in the body up to levels which where detectable and hence the testing window period. Thirdly, the antigen purification was not very good which led to a high level of false positives and hence the need for confirmation by Western Blot. There wasn’t a big leap of technology going into the 2nd generation test. Scientist just basically figured out a way to incorporate HIV 2 antigens into the test. There were also better antigen production techniques that improved the false positive rate. However the science behind the test went largely unchanged. There was however a huge leap of technology from the 2nd to 3rd generation ELISAs. The main change was the 3rd generation ELISAs could detect IgM as well as IgG antibodies. Because the body produces IgM way before it produces IgG, this significantly reduced the testing window period. How the scientist did this was to develop what is now known as a ‘Sandwich ELISA’ technique. Similar to the previous ELISA tests, HIV 1 and 2 antigens were placed in the microwell. 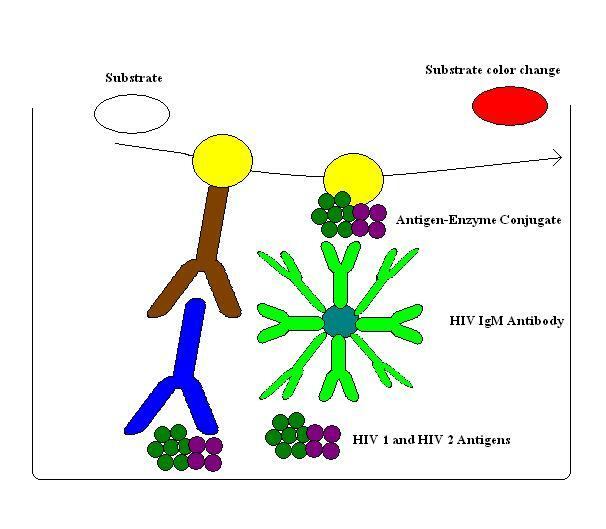 The anti-HIV IgM antibody would attach to the antigens. Now the thing about the IgM antibody is that it is like many keys attached to each other. In other words there are multiple antigen binding sites. This is very different from IgG that has just 1 antigen binding site. 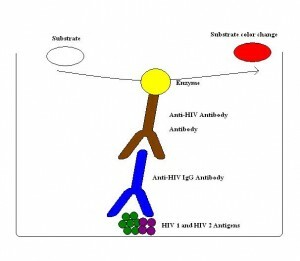 So what the scientist figured out how to do was to stick the enzyme and a HIV antigen together. So this antigen-enzyme conjugate will stick onto the other binding sites of the IgM antibody that has stuck onto the antigens in the microwell. The enzyme on the antigen then converts the substrate color thus enabling detection. Since the IgM antibody is ‘sandwiched’ between 2 antigens, the name ‘sandwich ELISA’ was coined. Lastly, we come to the so called 4th generation ELISA test. Not many people agree with this nomenclature because technically, it is identical to the 3rd generation ELISA test. Basically the 4th generation ELISA test is putting 2 different tests (i.e 3rd generation ELISA and P24 antigen test) onto the same test strip. Because the P24 antigen is produced even earlier than the IgM antibody, this reduces the testing window period even further. So you can see that there isn’t really a ‘4th generation ELISA’. So now you know everything you need to know about the different generation ELISA tests. Hopefully that gives you more confidence in discussing tests and test results with your doctor. Feel free to post any questions you have in the comments section below. I have taken chlamydia meds Doxymycin on July 2017. And on february and march 2018 i took hiv test and both came out as ecia reactive but western blot negative. And they describe it as no evidence of hiv found. My question is will the meds i took for chlamydia actually did this confusions on hiv test? The medications are not known to affect the results of HIV testing. I heard that this blood type don’t show anibodies against any virus in blood plasma sample test. My question is : if I have the virus in my body can HIV antibody test show negative? Am very worried about this news. I have not heard of such phenomenal. Hello there, i would like to know what is the window period for western blot test? I went for the normal antibody test (which is 6 weeks window period) it came out reactive and so they gave me western blot which is negative. Im wondering does the western blot as well has 6 weeks window period as the normal antibody test? I would recommend repeating the antibody test again +/- Western Blot at 3 months. Hi what is “+/-” means? Whats your window period like at your clinic ? The window period for hiv in my country is at 6 weeks.